After the Messiah gave them such remarkable reply on the coin and other questions (hypocritically asked), the chief priest and the high priest aspiration grew even more. The chief priest, the scribes and elders of the synagogue (temple), gathered at the home of the high priest (Caiaphas) to see ways of destroying (killing) the Messiah (Matthew 17). Probably all priests thought that getting the Messiah out-of-the-way would result in their replacement as prime glory among the Jews and populace. Actually, they thought Caesar and the Romans dignitaries would help to carry out such deeds. Moreover, rendering to Caesar his due would help to carry out the death of the Messiah. To strengthen their desires, and command a firm accomplishment, the elders pursued a plan. The elders (chief priest) of the synagogue, encouraged payment of “thirty (30) pieces of silver” to Judas Iscariot, one of the twelve disciples, on betraying the Messiah with a “kiss” (Matthew 26:15—16, 48 and 49). After the betrayal, the soldiers delivered Christ to Caiaphas, the high priest. It was then time for the gathering of all the elders, Pharisees, Sadducees, high priest and chief priest to record the FATE of the Messiah. In this council, they sought mean of creating a purpose, which they thought would please Caesar and Rome. Caesar, being please, as they considered, would encourage the pleasure “to put the Messiah to death” (Matthew 26:37-59). “Tell us whether thou be the Christ, the Son of God” (Matthew 26:63). The high priest, on hearing the Messiah’s reply, “rent his clothes, saying, he hath spoken blasphemy.” The high priest, joyfully to fuel the act, gained satisfaction on terms that the Messiah had laid the platform for His persecution. It was now clear in the eyes of Caesar that the elders of the synagogue determination were to destroy the flesh of the Messiah. The prophetic declaration given by the Messiah, was about to take its toll. The reward of the title “Pontifex Maximus” was on the rising, and for sure, the elders of the synagogue were anxious to undergo such event. The rendering unto Caesar continued its pursuit, seeing that the elders determination were to act trying to move the Messiah out-of-the-way. The teachers (Rabbies) of the synagogue continued to manifest their intention, which was obvious in all regards. Of course, the Jewish nation was special, as the heavenly Father chose them as a people. However, under influence of the evil one, many deserted their purpose in serving and honouring the ONE and TRUE Elohim (God). “All day long I have stretch forth my hands to a disobedient and gainsaying people” (Romans 10:21). “This people draweth nigh unto with their mouth…but their heart far from me” (Isaiah 29:13, and Matthew 15:8). Israel, after disregarding the prophets, “turned themselves to Baal”. In fact, likewise the scribes and Pharisees, during the moments of the Messiah, disregarded truth and rendered to the opponent (Enemy) what should be rendering to the Most High. Even during Pontius Pilate’s decision, the elders were clear on their plans, as the they found it necessary to get rid of the Messiah. Pontius Pilate could not sway from the council of the people of Rome, as they grumbled against his plea. “If thou let this “man” go, thou art not Caesar’s friend”… (John 19:12). Pilate decision remains challenging, as he asked the congregation (crowd) whom should he freed, but then the honour and the glory were given to the people rather that the Son of the Almighty. As custom, during Roman festive activity called “Easter”, there was a choice given by the people (citizens), which prisoners should they attribute freedom (Matthew 27:15). Upon this day of choice, being manoeuvre by the governor (Pontius Pilate), the Messiah, due to the reason of His birth, was not freed, but crucified. Barabbas, the “thief” and “murderer”, gets his freedom. Yet the crowd anguish rose and a “tumult” (Matthew 26:24) ensued, as the elders declared that they “have no king but Caesar” (John 19:12-15). When all said and done, they crucified the Messiah and buried Him at Golgotha. This rendering gave credence that the men rather to “serve mammon” than the “True Vine”. “for there are certain men crept in unawares…ungodly men, turning the grace of our God into lasciviousness, and denying the only Lord God, and our Lord Jesus” (Jude 1:4). Christ, in His prophetic bid, saw beyond the cloud, realising the determination of the evil one who would place himself in the assembly. The Son of the Father (Yah.) sees the future and the works of these ungodly men who crept in unawares, discriminating the glory of the Most High, giving it to someone (something) else. The Scribes, Sadducees and Pharisees question were not just about the attribution to Rome, but to play the Messiah in blame and to discredit His cause as the “Son of Man”. Moreover, the elders of the synagogue already attached themselves within the veils of Caesar (Rome), and yet, continuing as leaders of the people (Jewish). The Messiah, being a threat to their relinquishing religious fame, triggered a grudge, which propelled the elders (Pharisees) of the synagogue to act against Him. 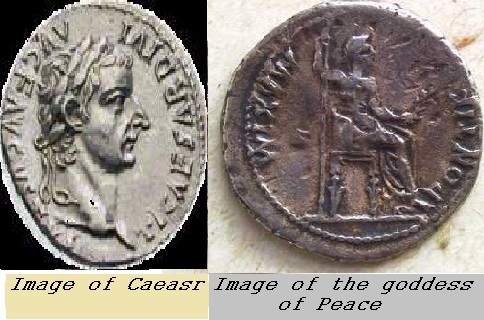 The first side of the coin (Caesar’s image and superscription) had manifested its ordeal, and now the other side of the coin is about to display. The elders began to consecrate their doings and will against any uprising different from that presented by the synagogue under the OT (Old Testament). In fact, Matthew 28:… gives evidence that the soldiers of the Roman guard assisted the task set out by the elders of the synagogue, in trying to lay the glory and possible uprising about the Messiah’s resurrection to nought. Actually, the work of treachery (Matthew 26:14-16) was not enough. The elders of the synagogue truly worked against the Messiah and His newly covenant, which result gave attribution to His crucifixion and death. Moreover, the elders wanted not for the report of the missing body of the risen Messiah to encourage an uproar of praise, so they went and paid “large money unto the soldiers” of the Roman army. This payment was for the support of false news about Christ and His missing body (Matthew 28:1-15). Christ, in His confrontations with the scribes, Sadducees and Pharisees, continued to address them as HYPOCRITES (esp. in Matthew 23). Moreover, Christ reasoned with the multitude and disciples saying, “the Scribes and Pharisees sit in Moses seat” seeking the blessing (attributes) that does not belong unto men, and that they “shut up the kingdom of heaven against men; … neither go in yourselves…” (Matthew 23:1-13). They seek notification as “RABBI” (“master” and “father”), and in doing such act; they seek the glory and attributes credited (rendered) unto the Most High and the Son of Yah. They, instead of giving glory, unleashed their breed of covetousness, envy, and strife against the King of the Jews. In fact, as wanton of such glory, and not receiving, they rather “render” such honour to Caesar and his throne. Pingback: THE HIGH PRIEST – PHARISEES – PLANS SOUGHT AGAINST THE MESSIAH – PT 3 – RENDER THEREFORE UNTO CAESAR (MATTHEW 22:22) | My Blog Title is "THE UNVEIL PERSPECTIVE"